The bibulous Mr Smith was no pillar of virtue. Crossing the Atlantic Ocean on the Enriqueta, he met someone he knew on board at midnight – and was strangled. Chief Inspector Shand of the Yard, a fellow traveller on the luxury liner, takes on the case, ably assisted by his friend Jasper Mellish. At first the only clue is what the steward saw: a bandaged face above a set of green pyjamas. But surely the crime can be connected to Mr Smith’s former – and decidedly shady – compatriots in Buenos Aires? 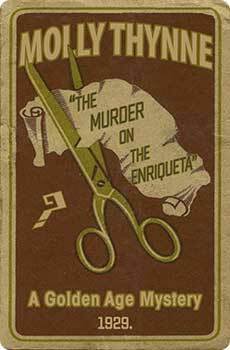 The Murder on the Enriqueta (1929: originally called The Strangler in the US) is a thrilling whodunit, including an heiress in peril and a jazz age nightclub among its other puzzle pieces. This new edition, the first in many decades, includes an introduction by crime fiction historian Curtis Evans. To lay aside a yarn so crammed with situations thrilling.